Over 25 years ago, Mike Fisher crafted his first "Secret Box" for a special friend. From that humble beginning, Heartwood Creations has established itself as a group of talented craftspeople from America's heartland whose products are shown in many of the finest craft shops and galleries the world over. While our company has grown and new products have been created, the "Secret Box" remains our trademark. Each box is made from the heart. 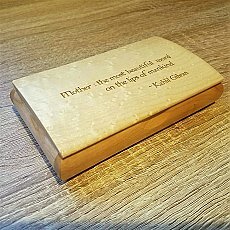 The craftspersons' mark that signifies their care and love of woodworking is the little heart that you see on every box.